You are currently browsing the tag archive for the ‘orchid hunters’ tag. Yes, I am that guy who actually liked Spike Jonze’s Adaptation. Not only is a film about trying to adapt a book too difficult to translate to film, but it also touched on the major themes of Orlean’s book. That all-consuming passion turned inward becomes destructive, obsessive, overtaking one’s life. While Kaufman’s conceit of writing himself into his own screenplay proved to be quite entertaining, it echoes Orlean’s own role in her book, initially a mute observer of the fascinating history of orchids and those obsessed with them, such as the captivating John Larroche, but later becomes a less neutral party. Kaufman’s script satirises the Hollywood process of adaptation by forcing the two characters into a romance. 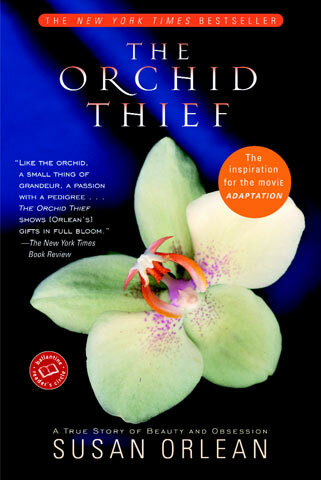 The Orchid Thief was originally published as a series of articles in the New Yorker. As such it presents not only a profile of the charismatic Larroche, but delves into the history of orchid hunters, risking their lives for the benefit of distant private collectors back in Europe. They travel through the jungles of Asia and South America to acquire vulnerable and delicate looking orchids, shipping massive quantities of earth and flowers back home. Often in their pursuit of their master’s demands they laid waste to the natural environment that gave birth to the orchid. They would also be actively competing with other agents, resorting to misinformation, theft, sometimes even murder. The civilized shows of exotic varieties of flowers in the stately mansions of the Royal Botanical Society were therefore the pristine product of vile misdeeds and skullduggery. Here we have Orlean travelling from coolly austere New York to the sweating wild preserves of Florida, the darker side of the history of orchids continues to thrive. Rival orchid enthusiasts have been known to resort to theft and Orlean at one point describes a professional rivalry that quickly spirals out of control between two men, Frank Smith and Bob Fuchs, the latter of whom belongs to three generations of ‘orchid royalty’. Then there’s Larroche himself, whose skewed morality led him to make approaches to the Seminole Indian tribe, convincing them that as the Fakahatchee Preserve legally belongs to them they are entitled to take whatever they want from the swamp land. After the tribe finds itself mired in legal wrangling with the state, Larroche earns the name ‘Crazy White Man’, or ‘Troublemaker’. Right and wrong, legal wrangling and criminal misdeeds, the study of orchids is the pursuit of beauty above all else and does not allow for such considerations. It also appeals to that most reptile brain of ours, the need to possess something, to prevent others from doing the same. Orlean relates this in the calming, discursive style so familiar from Time magazine and Salon. The material is related in a familiar, clear conversational manner, her relationship with Larroche providing an excellent hook for the reader, as well as the nominal quest to find that most rare of flowers, the ghost orchid.